or visit our website here! Summertime is here! That means a brand new round of A Gift of Music Classes. This year we've cooked up something so beneficial and fun for children in our community! 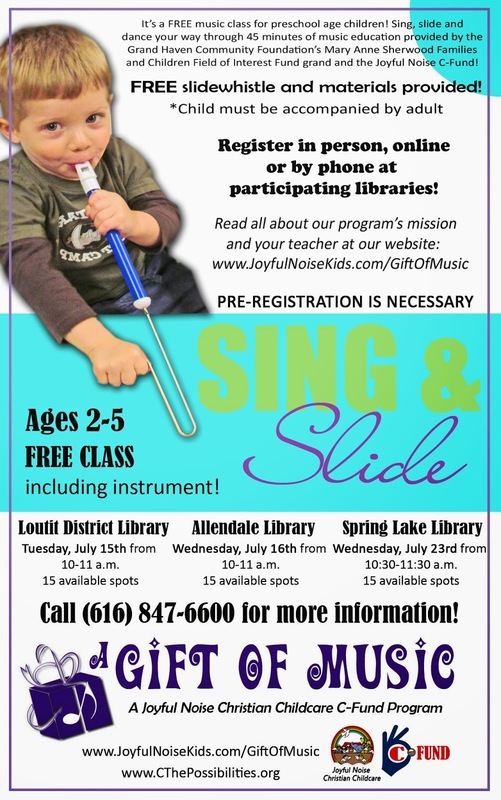 Sing & Slide, for ages 2-5, is a free music class offering an instrument and take home materials for kids! Read all the details about the program in our Program Backrounder, here! Also check out the official press release. That's not all we're doing for our early childhood community this year! Our instructor Chantal McDaniel is also traveling to Stepping Stones daycare (a service to the homeless and transient community and a part of Holland Rescue Mission) in Holland, Michigan! For three consecutive weeks, children will recieve on site early childhood music classes: fun songs, movement, and instrument exposure, along with send-home materials for parents and extenders for teachers at the daycare. Check out the awesome instrument donation we were able to pass along to Stepping Stones due to a generous instrument donation from Kathleen McDonald, retired music and special education teacher from Mason, Michigan!